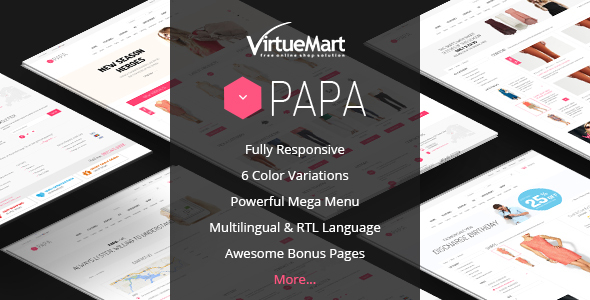 SJ Papa – Great responsive Joomla template for eCommerce sites. Based on the latest YT Framework version, SJ Papa is fully responsive. The template works well and fits well on all the web enabled devices and mobile browsers. The powerful Joomla template framework – YT FRAMEWORK V2 is flexible with Bootstrap3 at core. You can easily customize most of SJ Papa parameters without much coding knowledge. With YT Framework at core, SJ Papa is fully responsive Joomla template and looks delightful across different devices and screen layouts as well. For Quick View feature, you can have a move on through any product without going into the product detail. This makes SJ Papa more convenient and effective. This is an interesting feature for SJ Papa store. It helps to show more elements like: another product image, zoom option, detail link… on mouse hover in product slider.